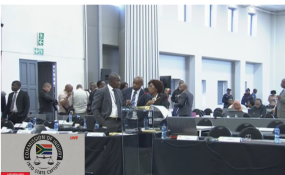 "We did not resume at 14:00 because there was a security situation connected with the hearing," Zondo said following an hour delay after lunch. "It is necessary that those who come here are safe, and we need to give necessary officials time to do their work," he said. Earlier on Thursday, Angelo Agrizzi, former Bosasa executive, who testified before the commission, told Zondo that a former policeman, Solomon Segale, who is a special operations manager at Bosasa according to his Linkedin page, slipped into the hearings. He said he saw Segale standing with a group of uniformed policemen on Wednesday and "slipped in (with) his old police card without proper accreditation". Agrizzi told Zondo that he was "concerned" about this.